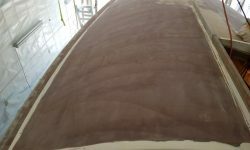 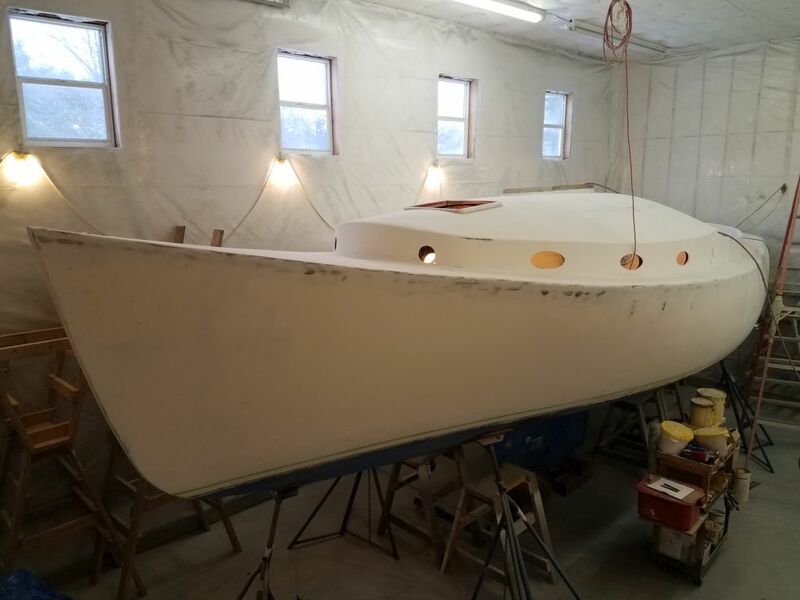 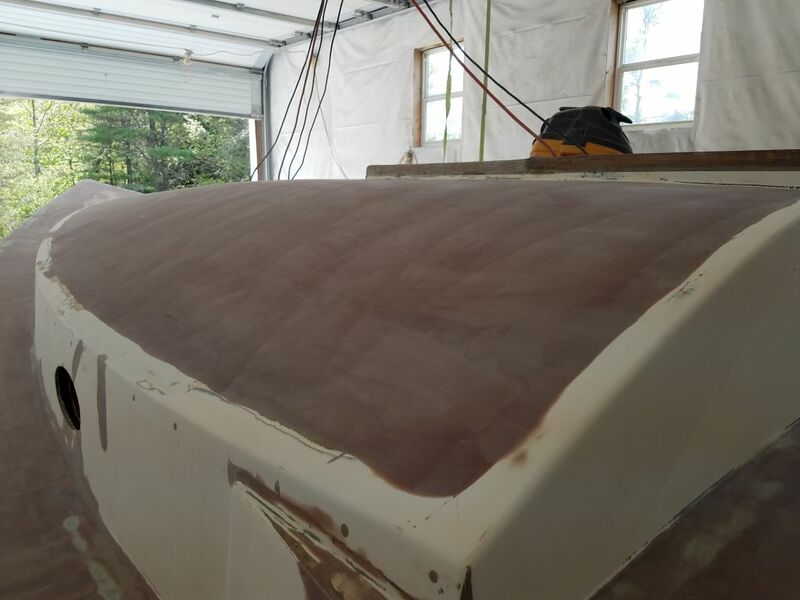 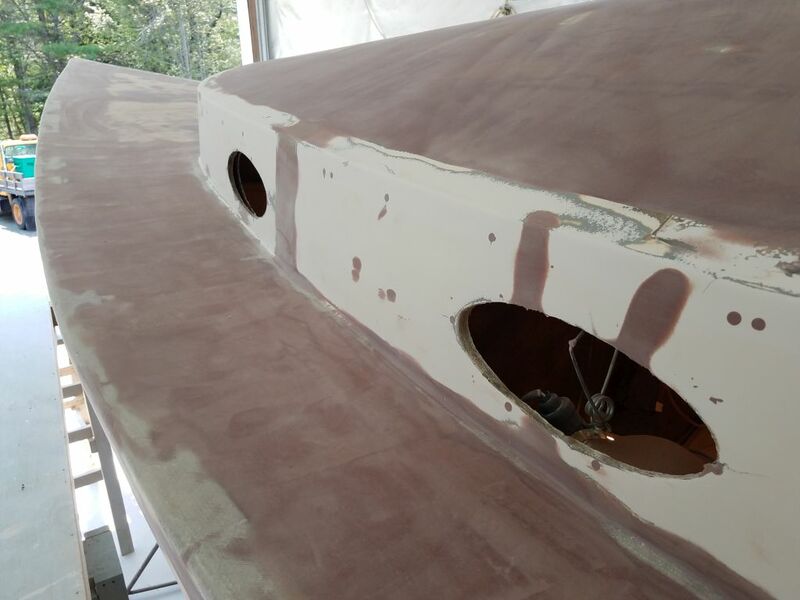 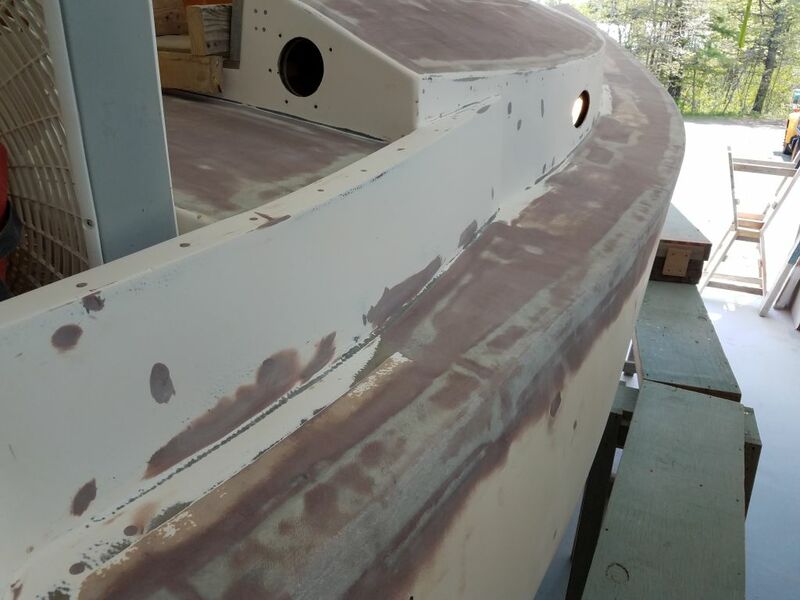 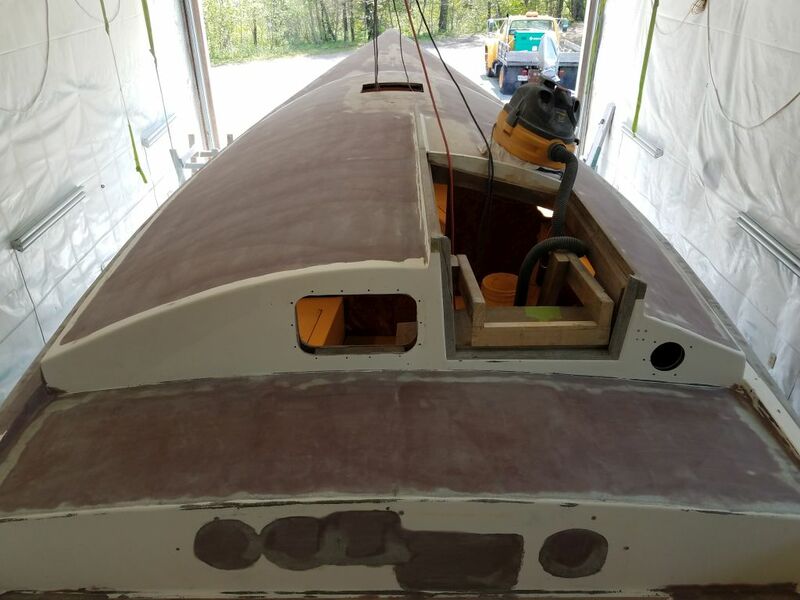 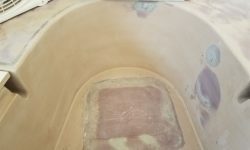 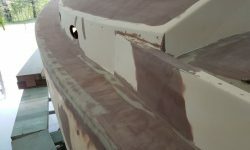 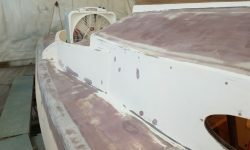 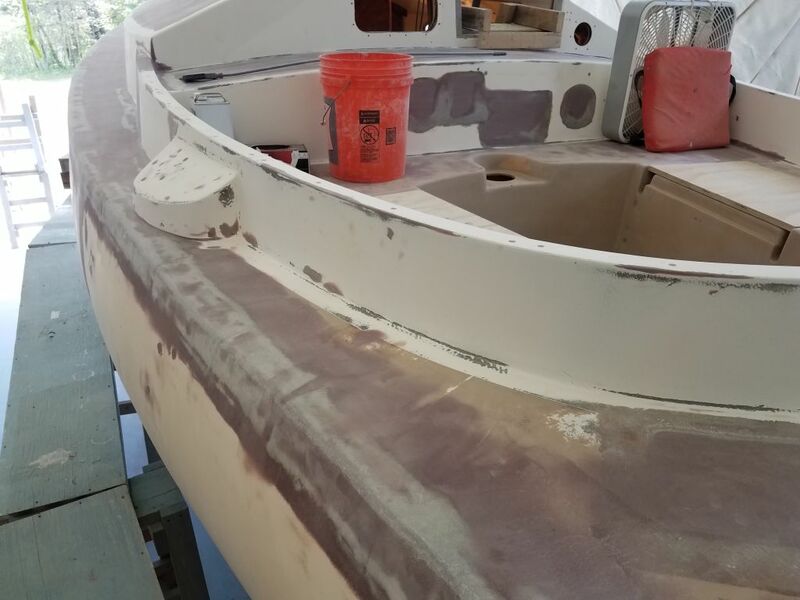 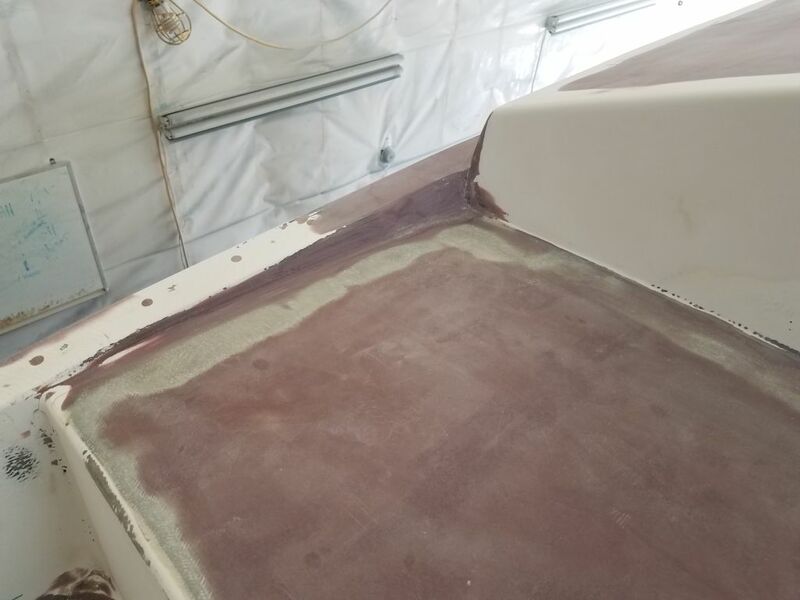 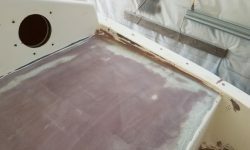 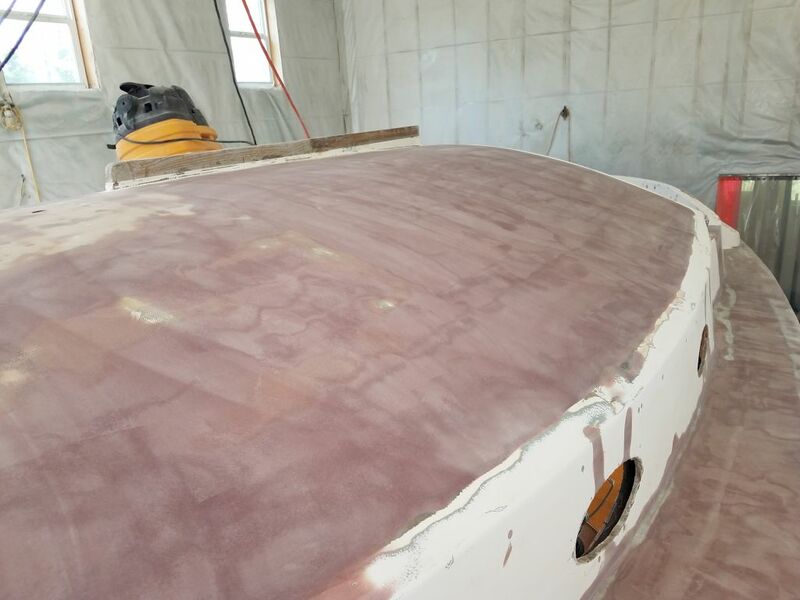 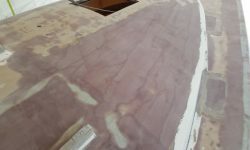 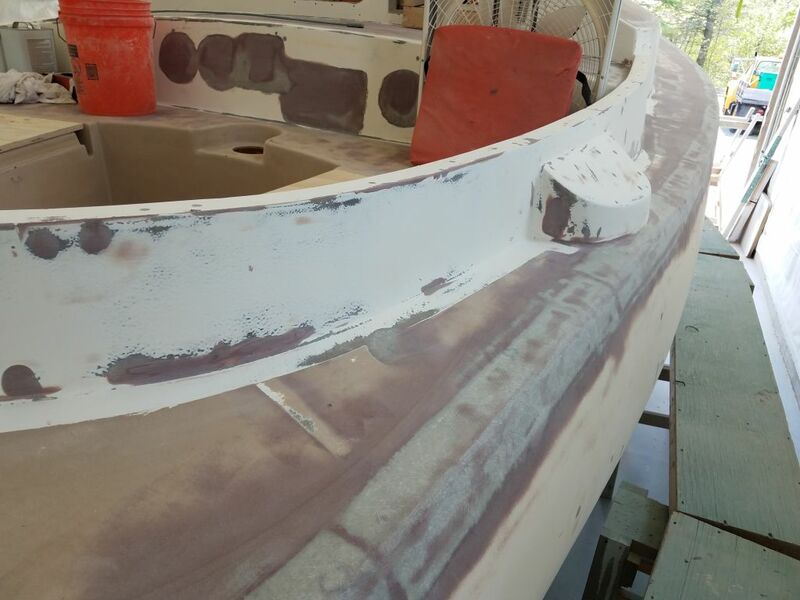 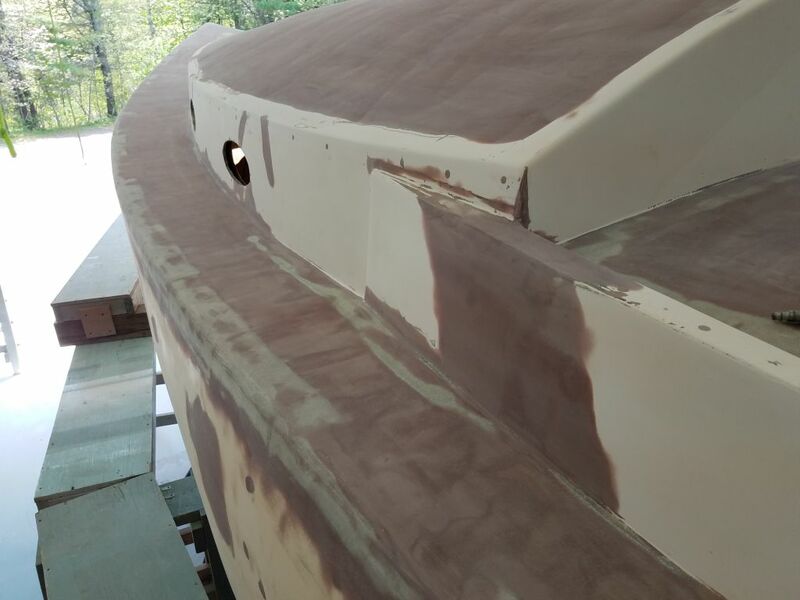 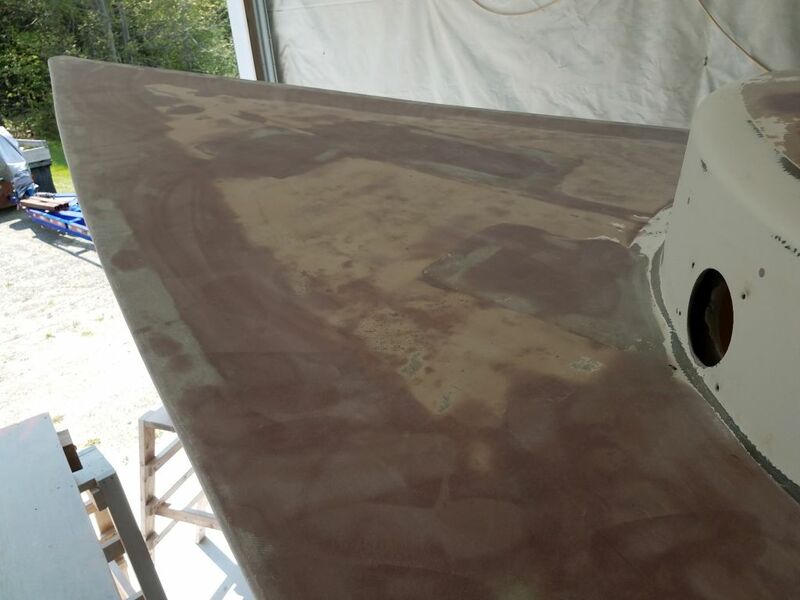 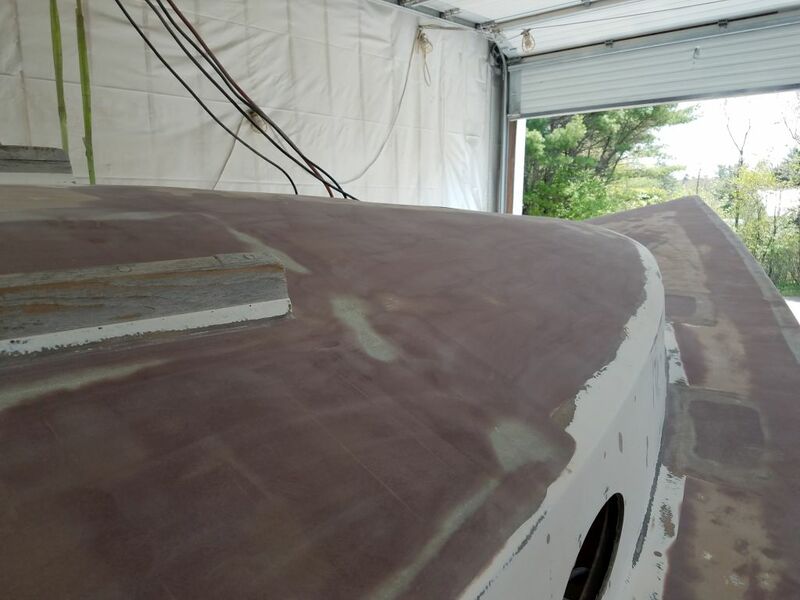 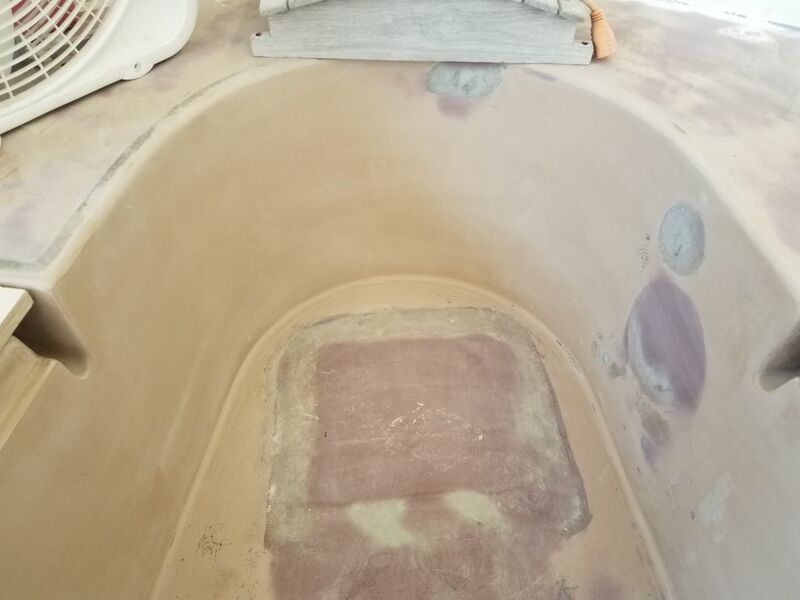 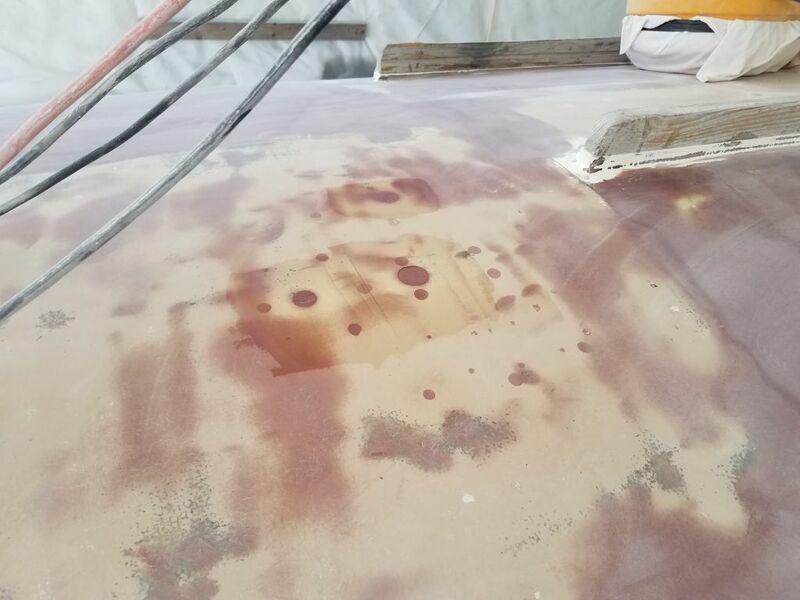 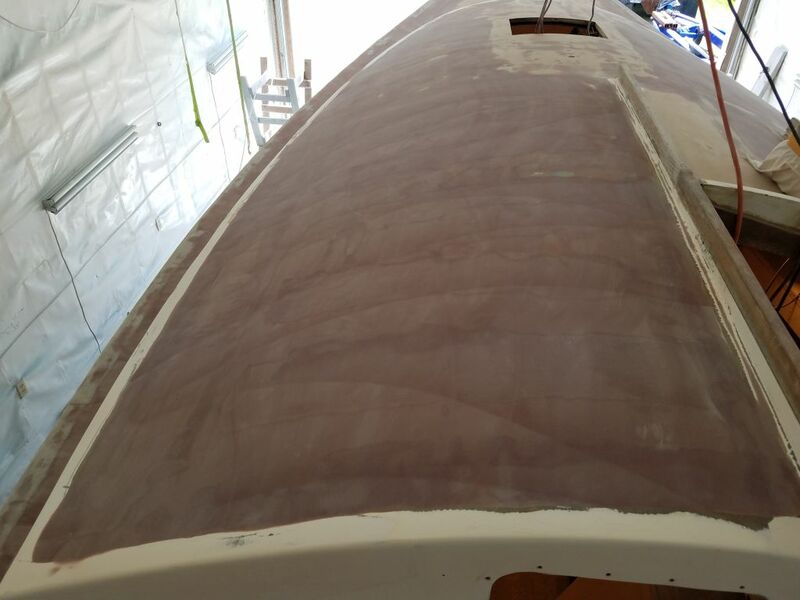 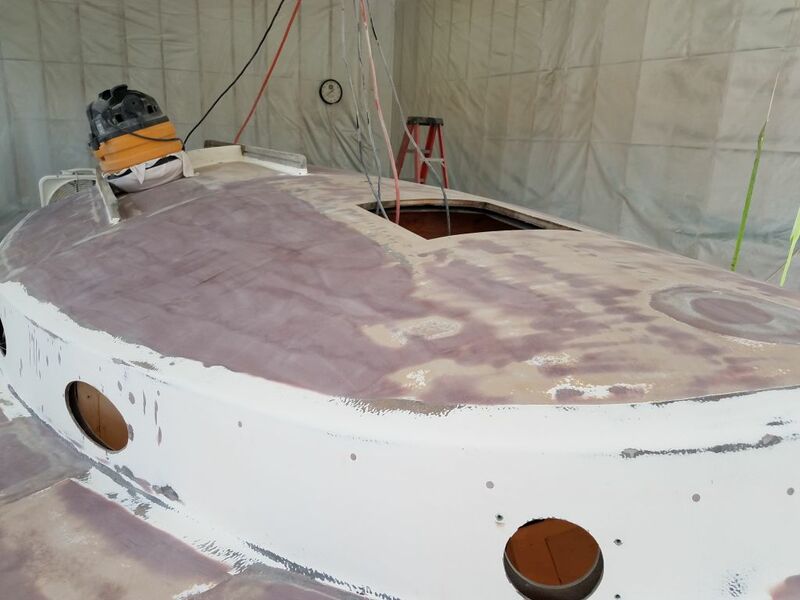 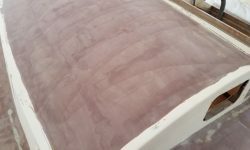 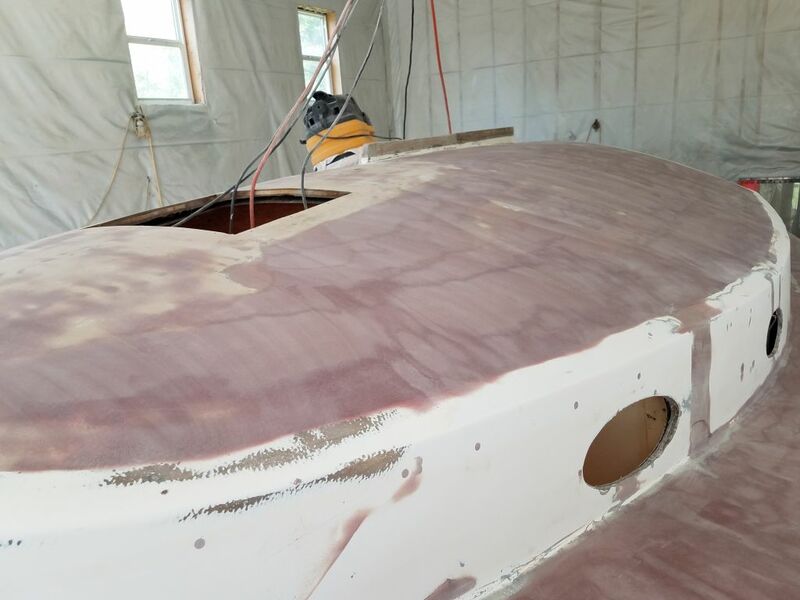 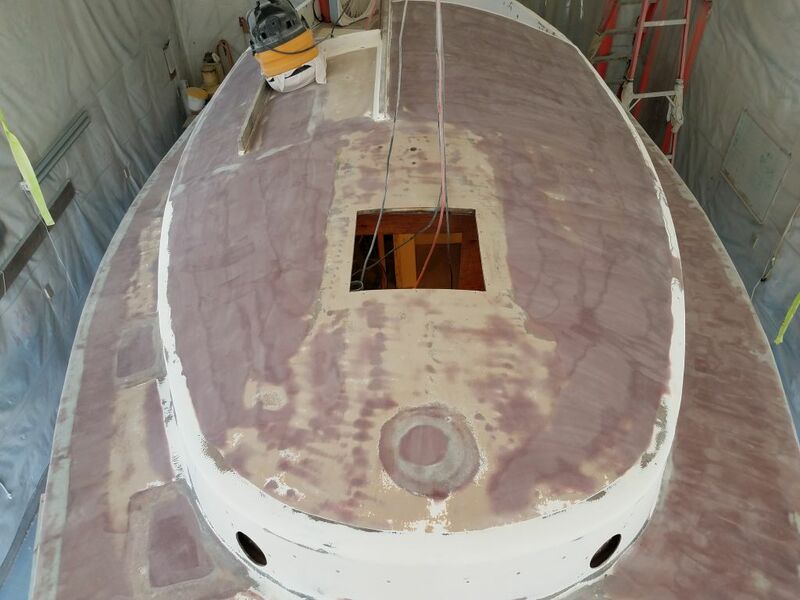 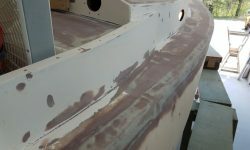 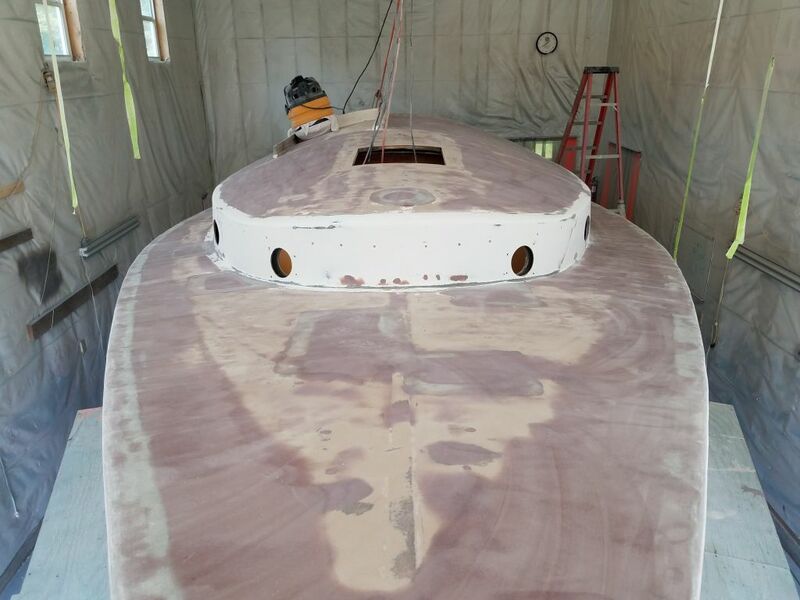 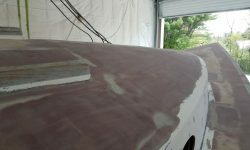 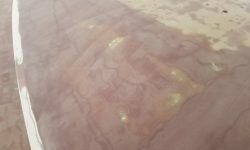 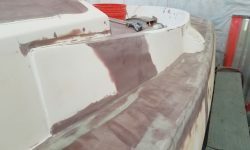 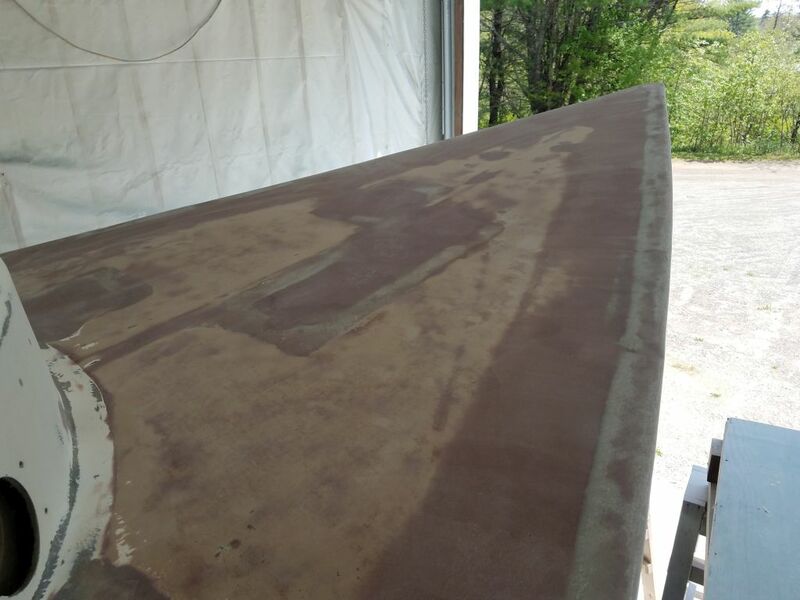 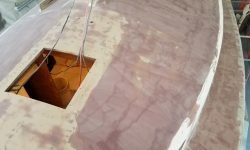 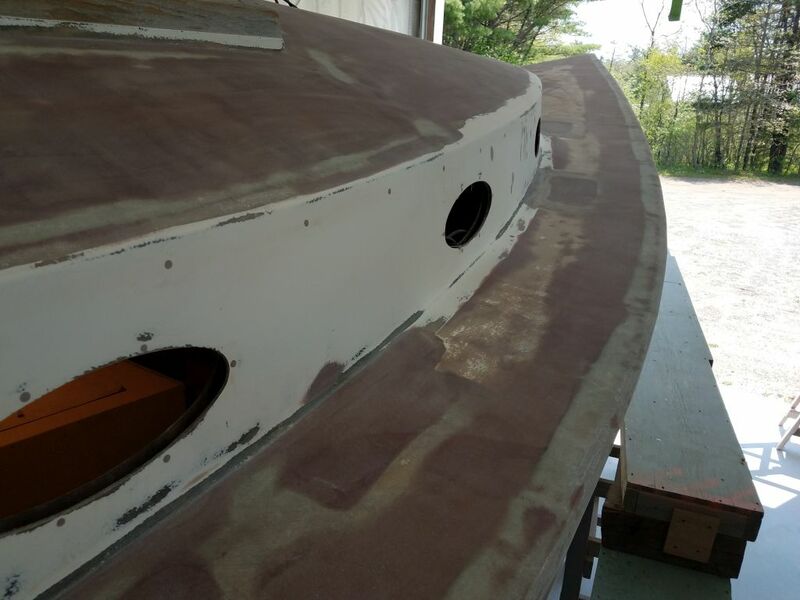 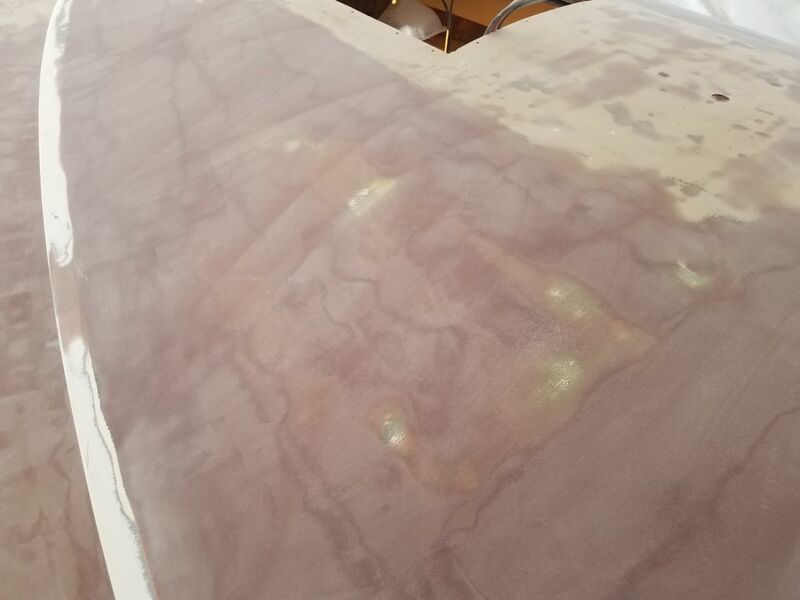 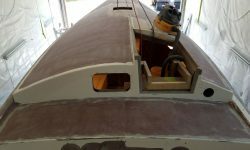 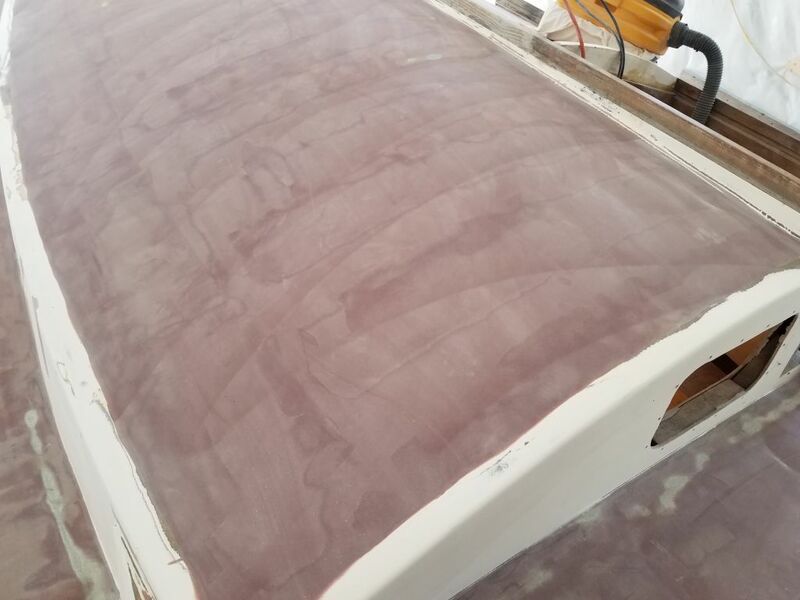 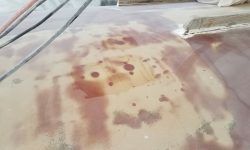 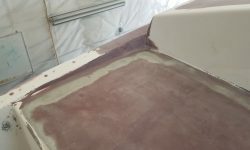 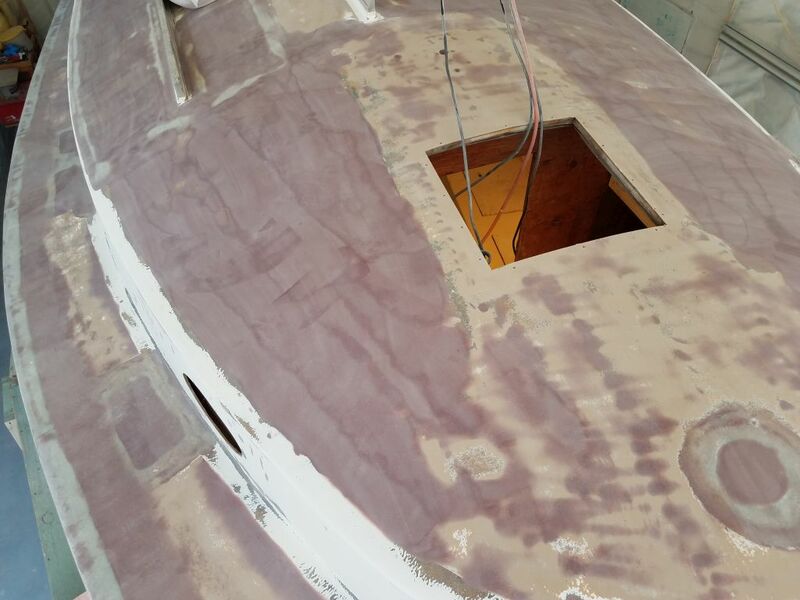 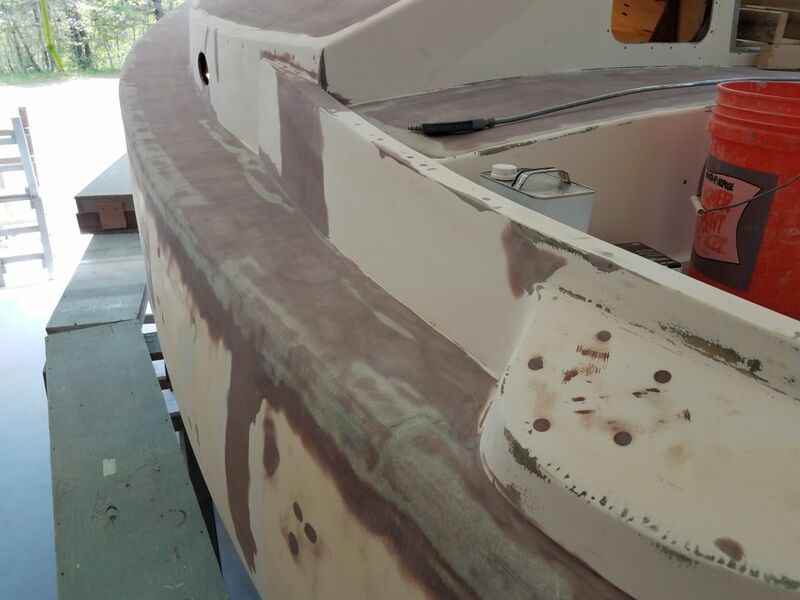 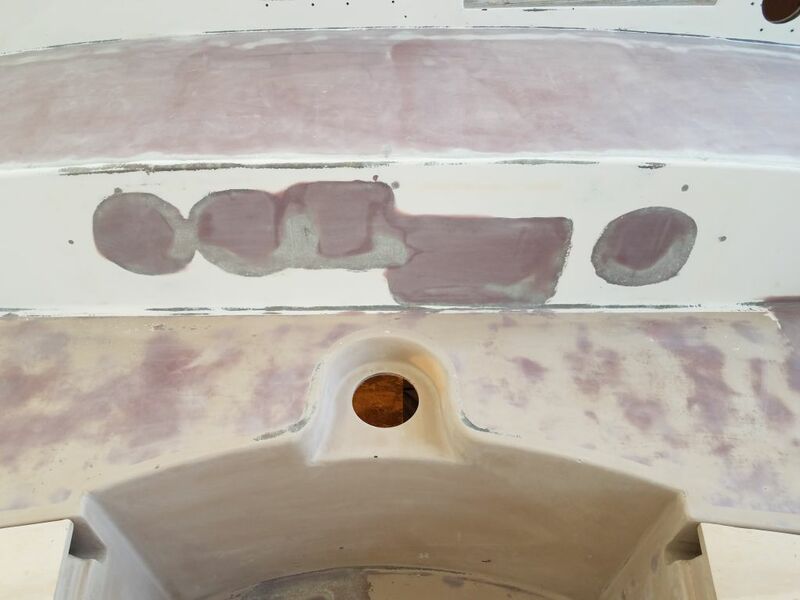 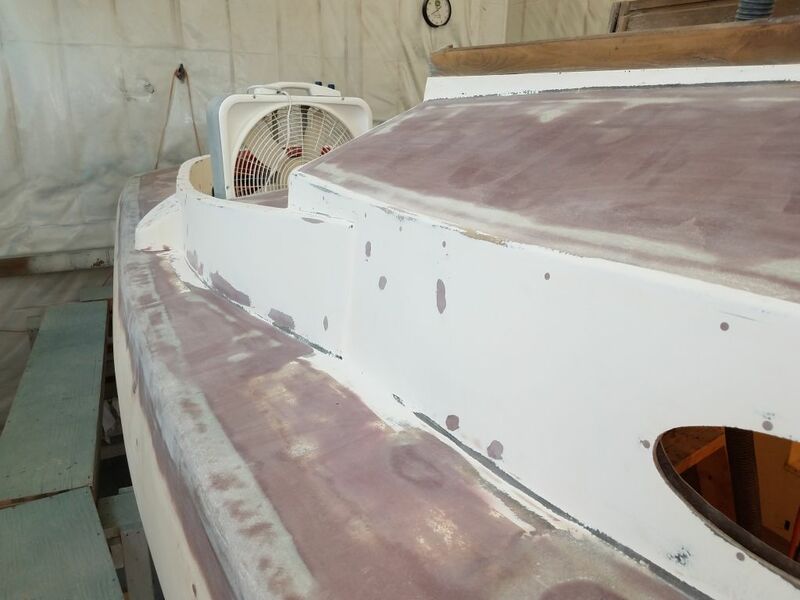 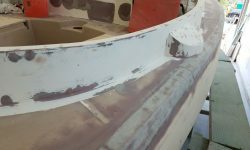 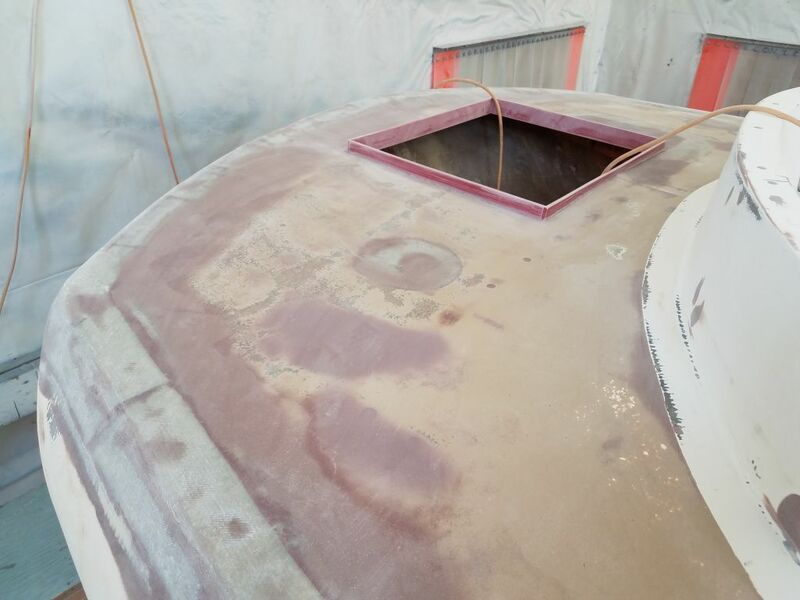 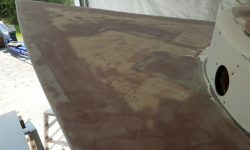 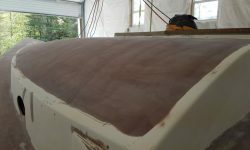 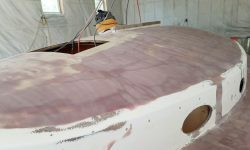 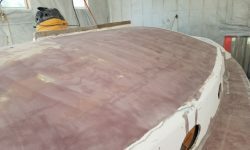 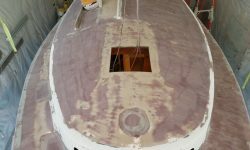 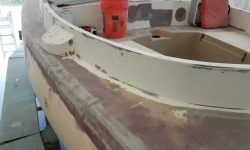 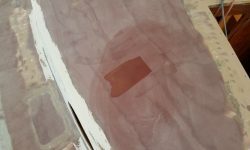 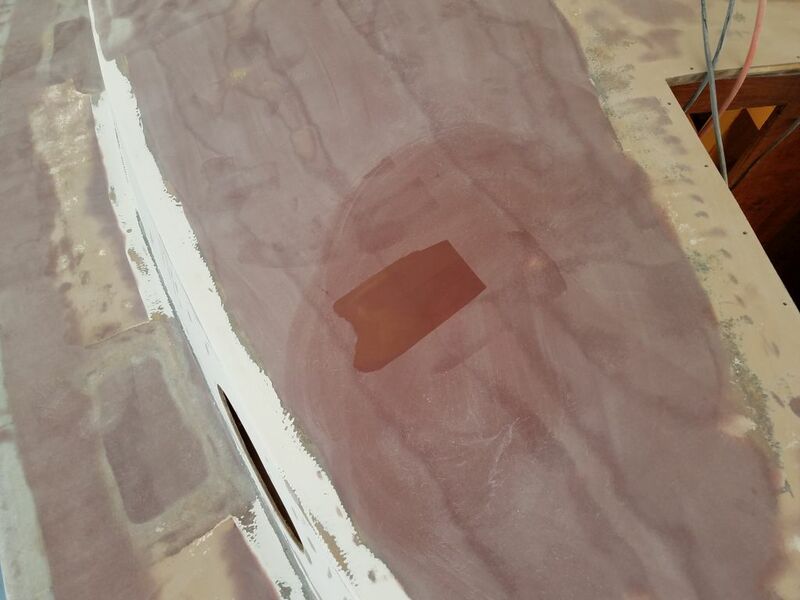 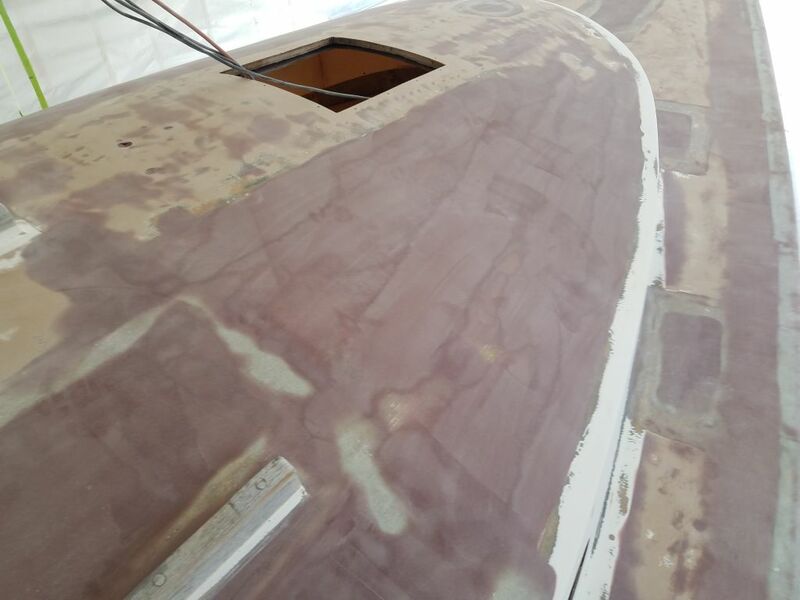 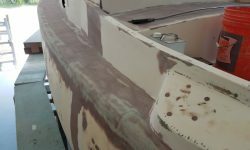 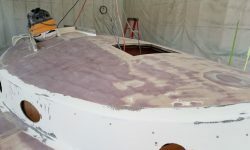 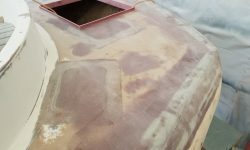 Using a finish sander, I smoothed the last application of fairing compound on the coachroof, and continued sanding the coachroof through the grits to 120, completing the refairing work on this area. 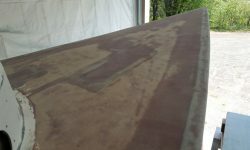 One small spot, a remnant of a trowel mark, remained on the starboard side and would require some additional fairing compound. 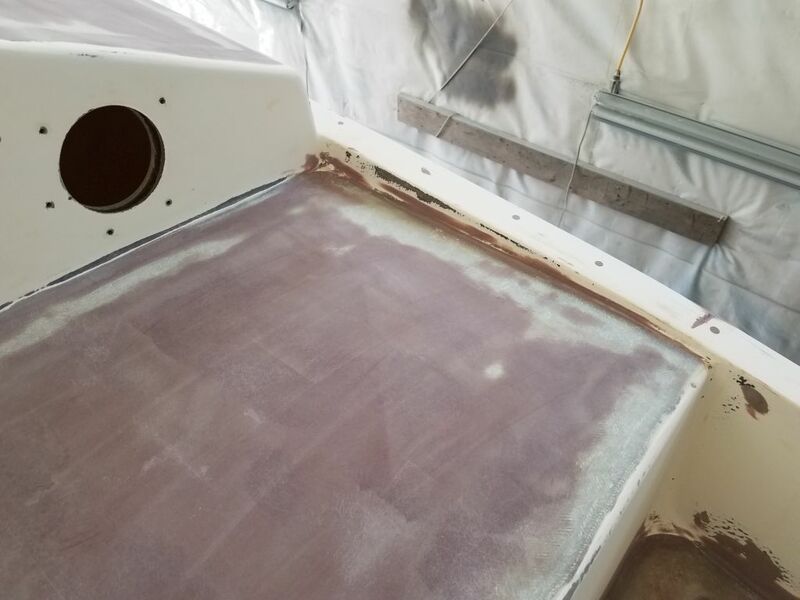 Starting next in the cockpit, I used a palm sander and worked by hand as necessary to complete the final rounds of finish-sanding, taking care of tight corners, rounded edges, and the gutter areas around the cockpit lockers through 120 grit. 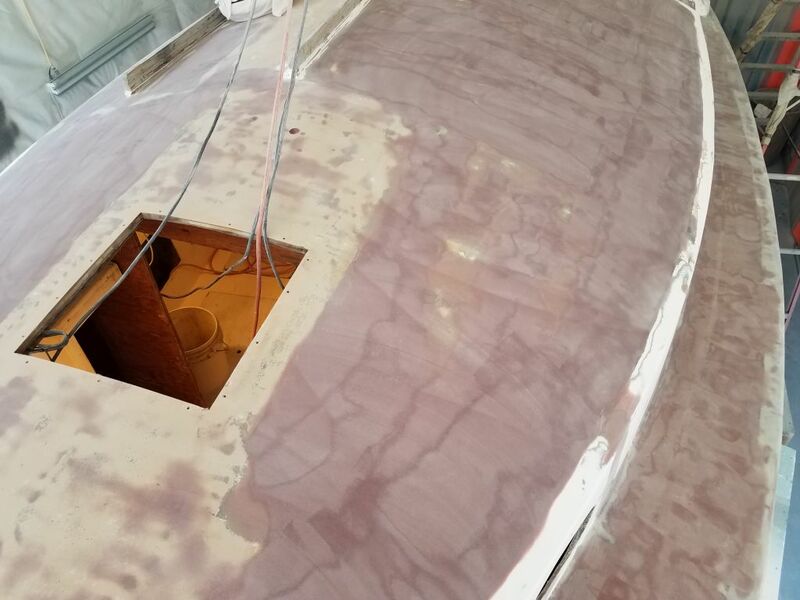 I continued on the sidedecks with minor final detail sanding as needed at corners and other spots, including lightly sanding the new deck edge. 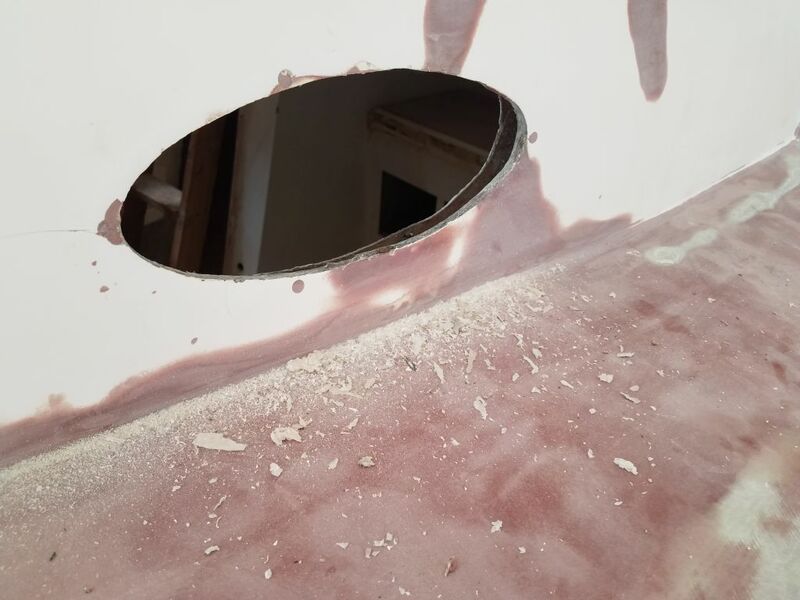 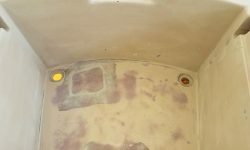 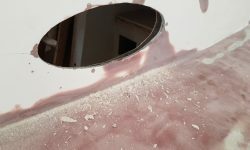 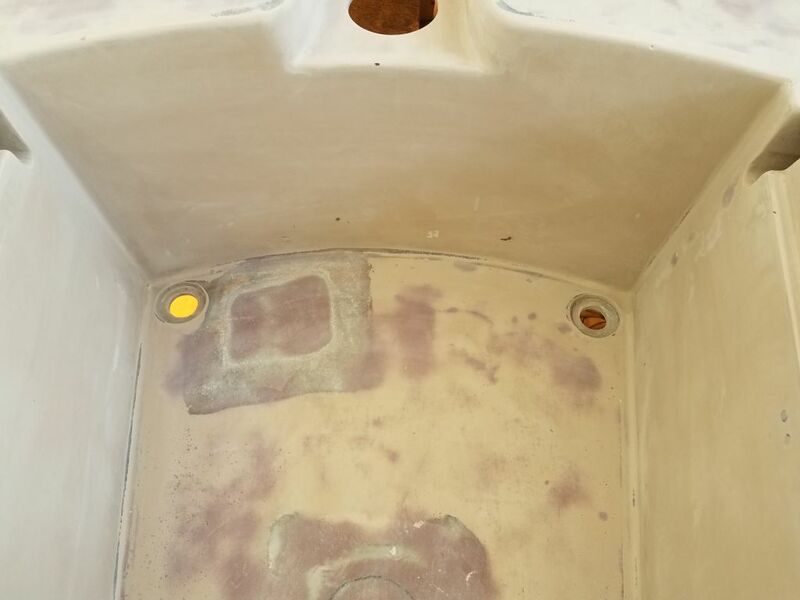 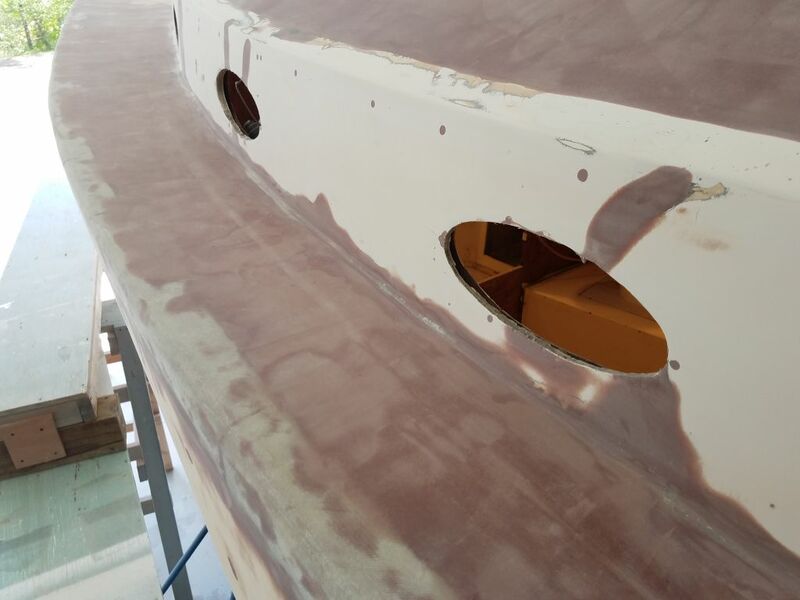 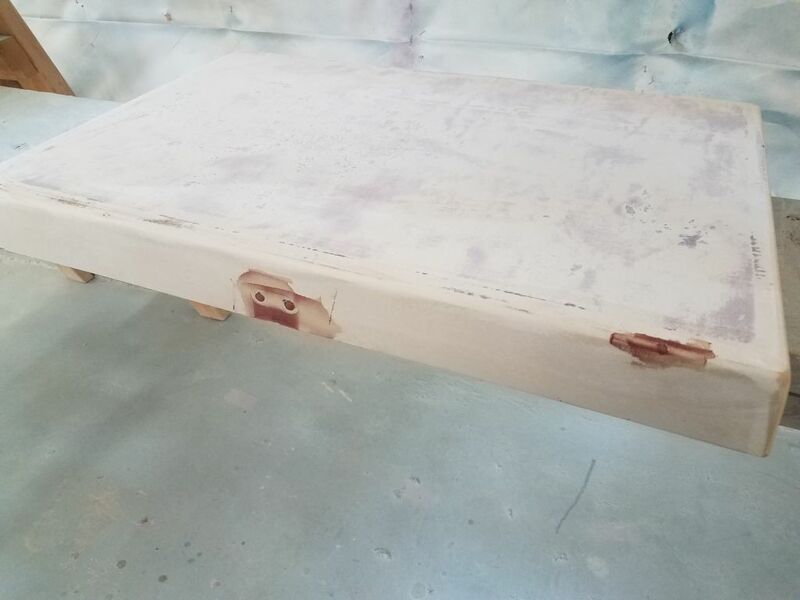 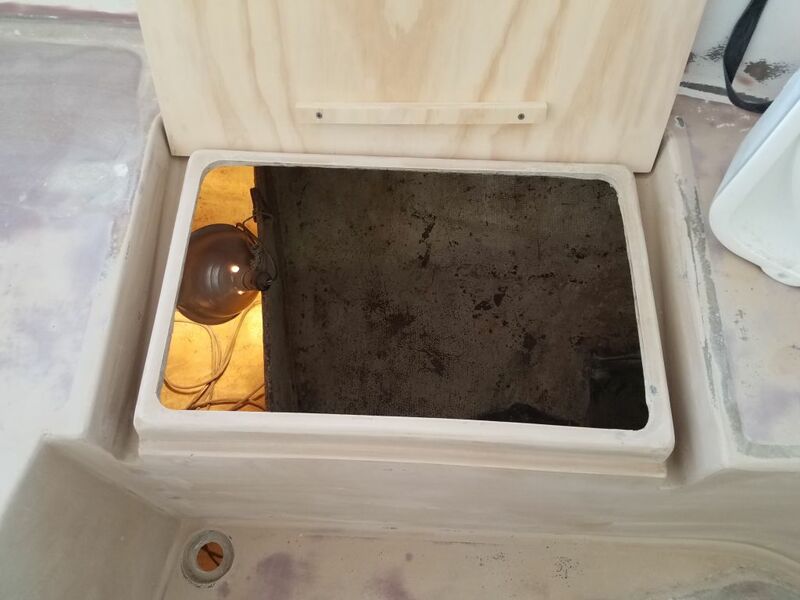 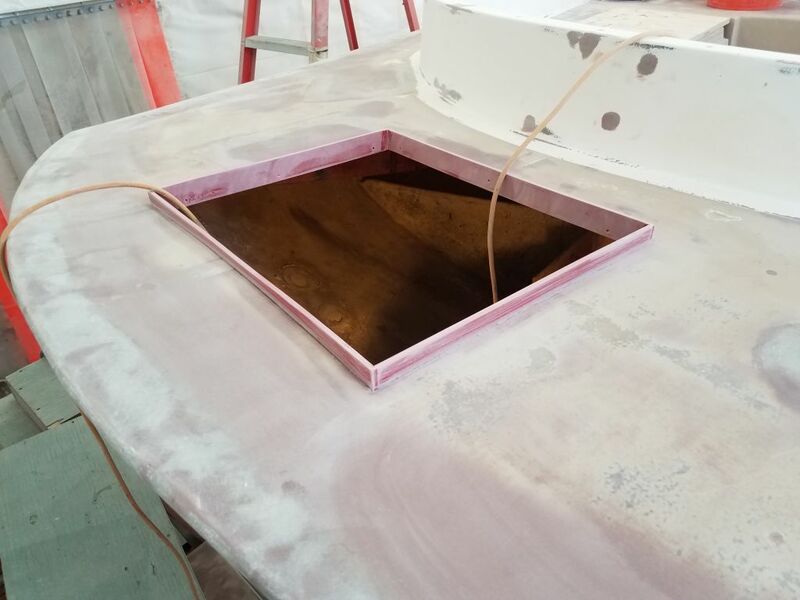 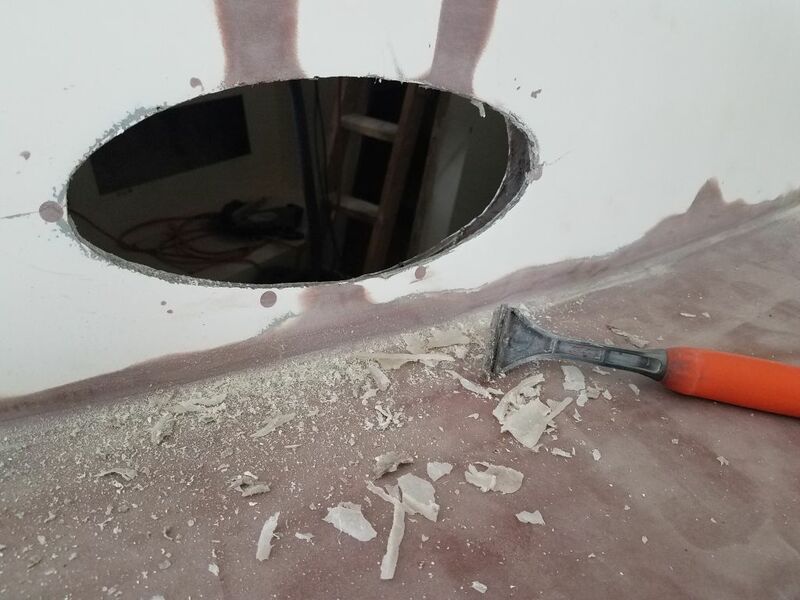 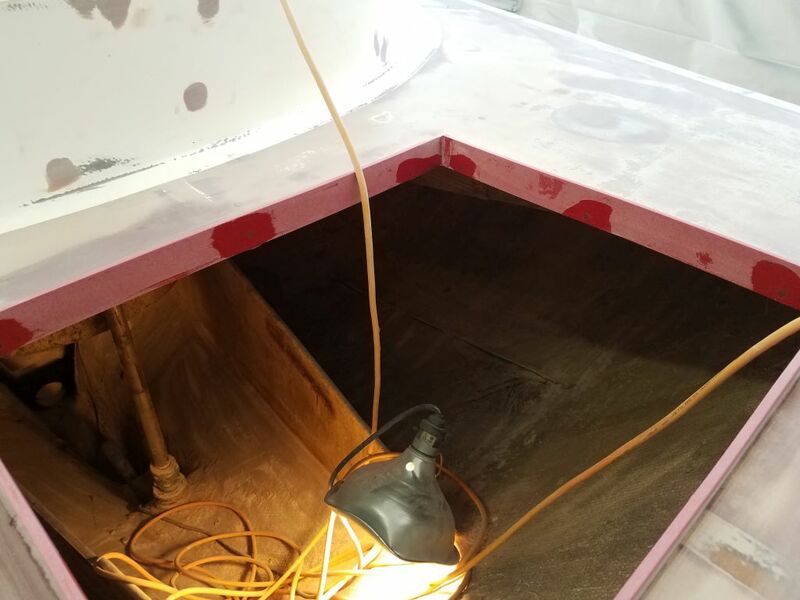 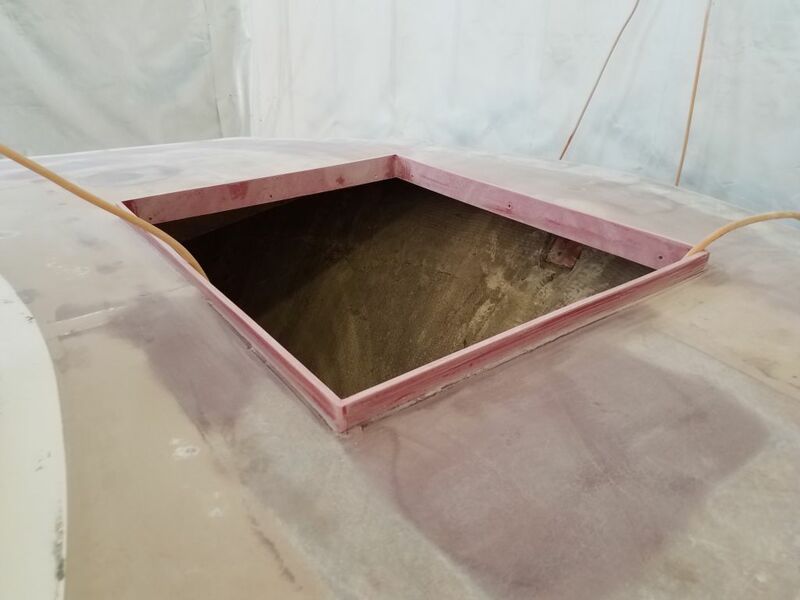 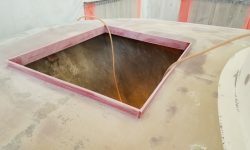 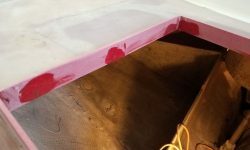 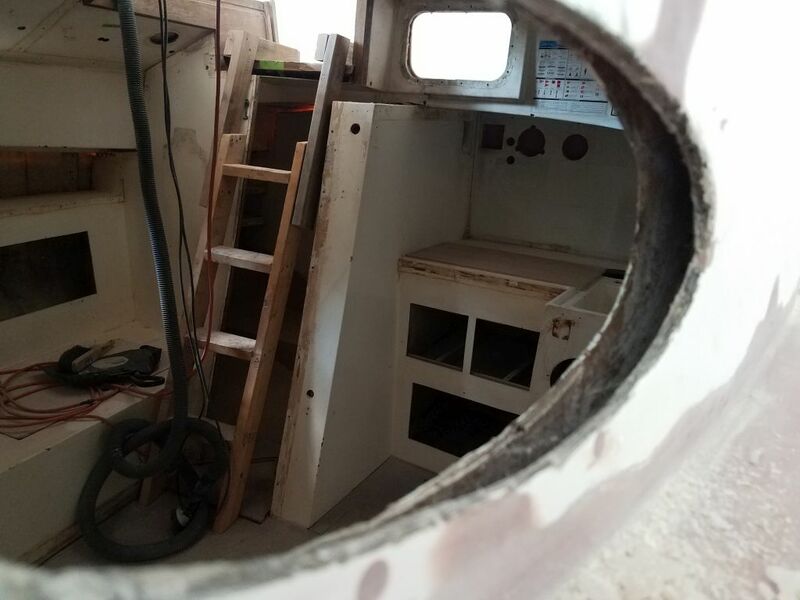 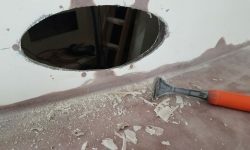 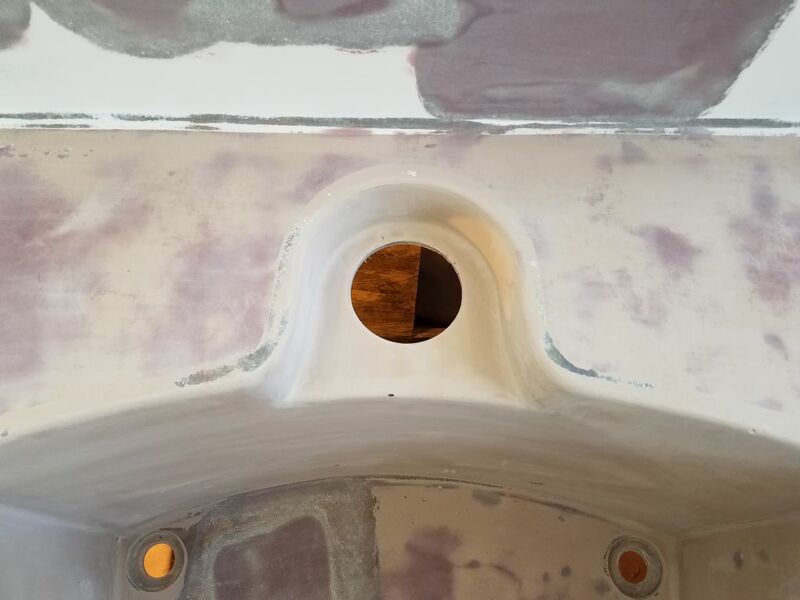 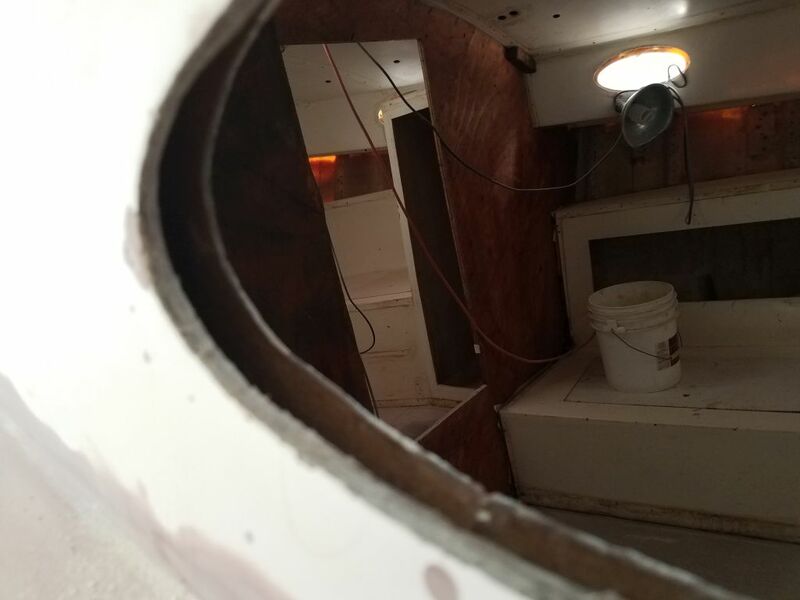 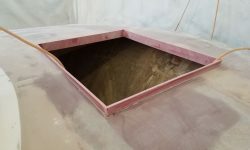 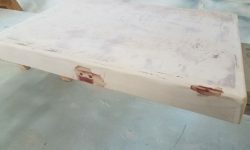 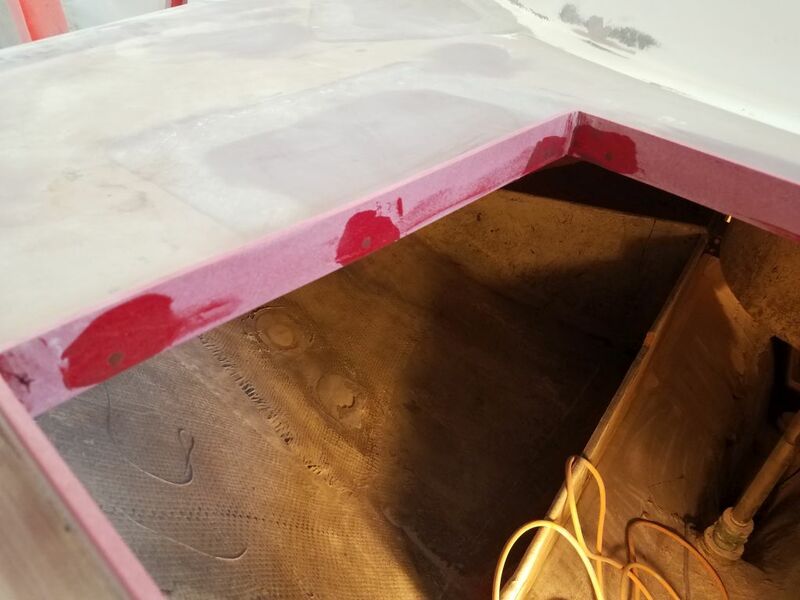 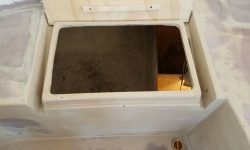 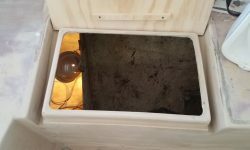 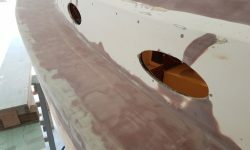 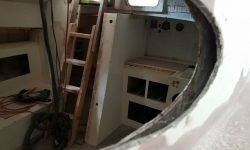 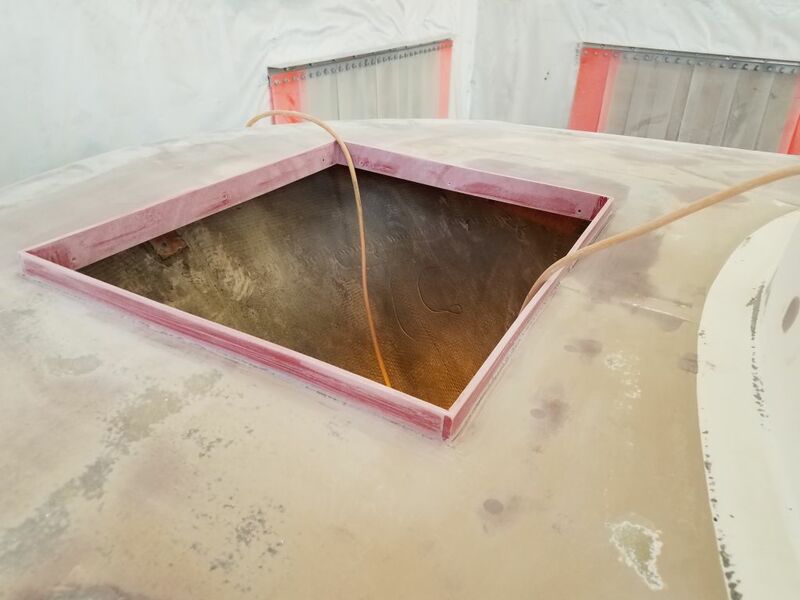 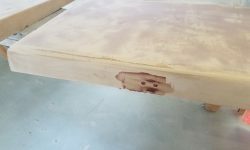 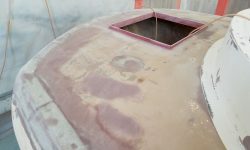 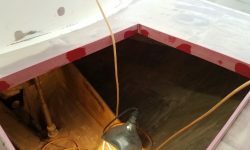 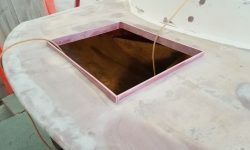 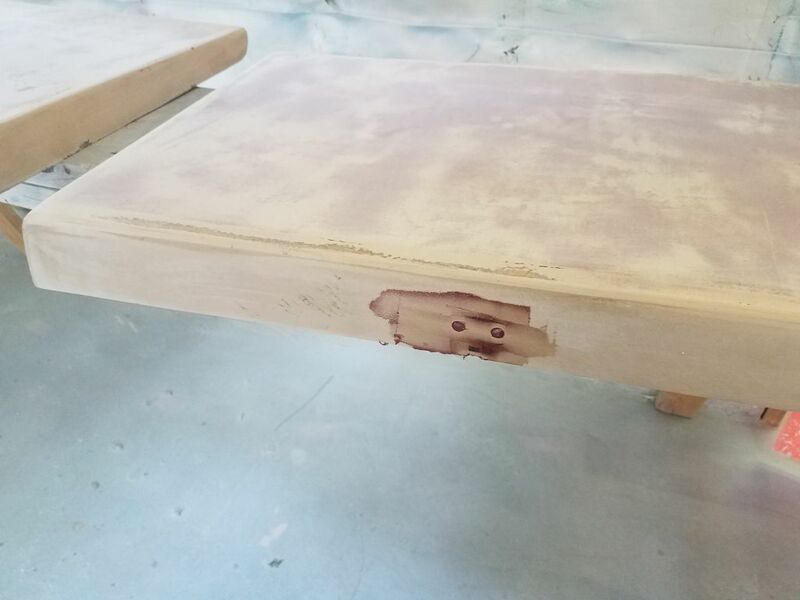 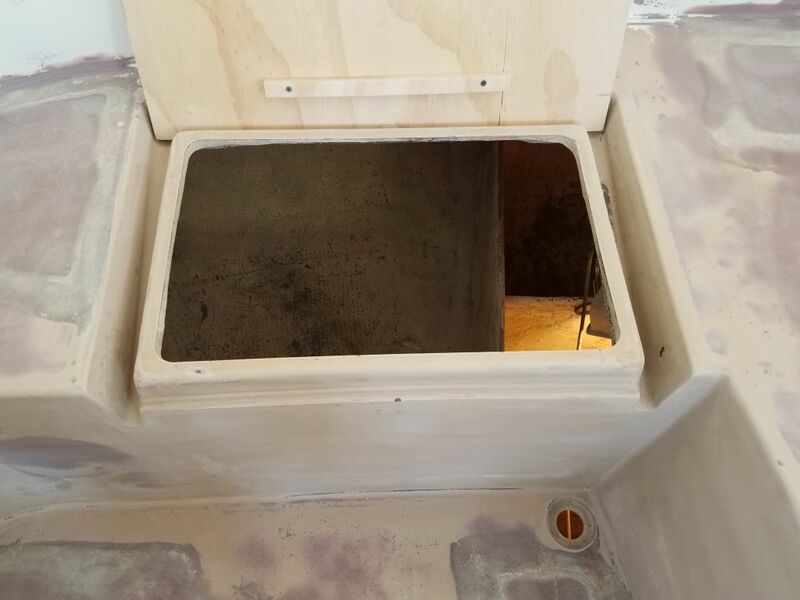 I removed the temporary screws from the new lazarette hatch coaming, and after some light sanding and reaming out the screw holes, I applied some epoxy filler to seal up the holes. 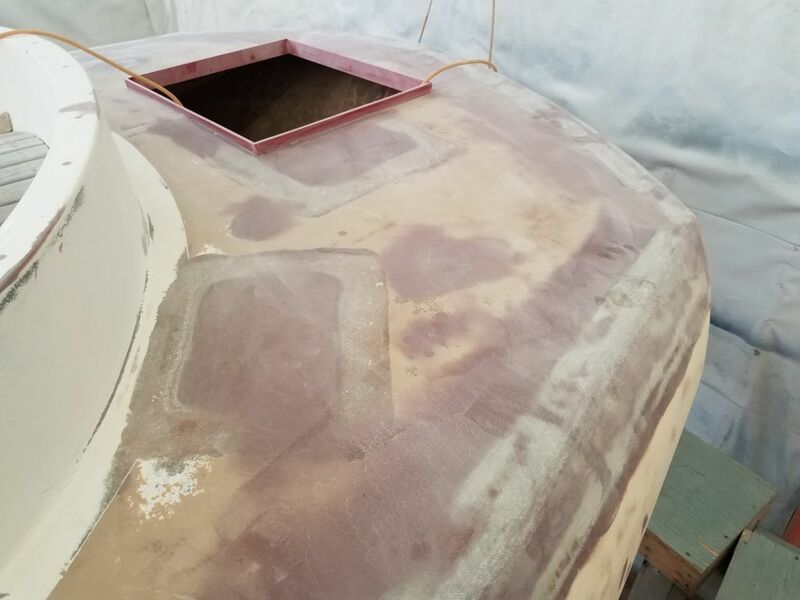 On the coachroof, I cleaned up and applied a spot of fairing compound to the one small groove that remained, along with some touch-up on some mast step wiring holes that I’d only decided to fill at the last minute, as well as some additional screw holes in the cockpit locker hatches. 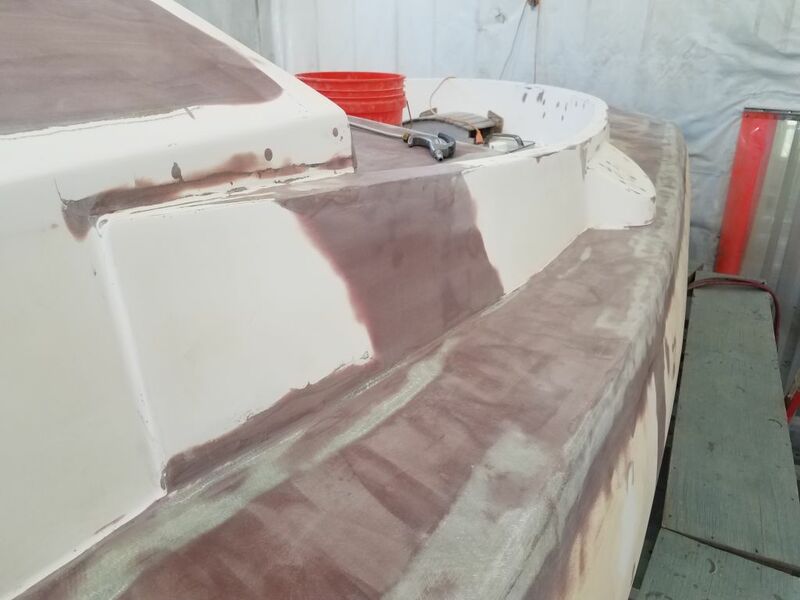 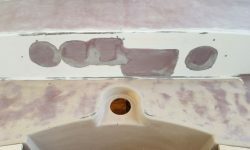 Later in the day, after a break to work on an unrelated project, I was contemplating the virtually-completed deck repair work and deciding whether to move the staging so I could continue the final work on the hull, when I realized I should clean up the port openings before continuing. 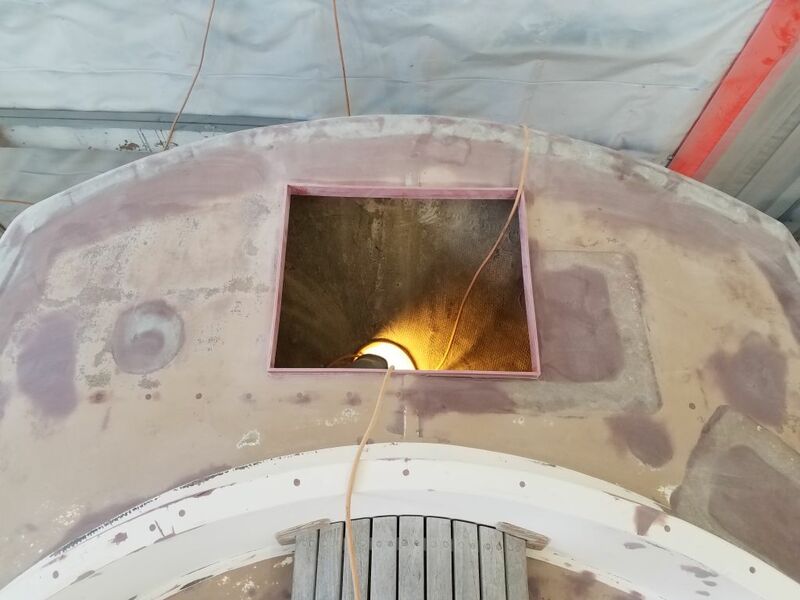 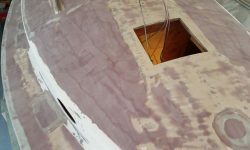 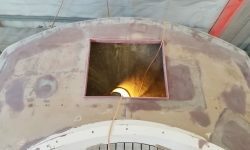 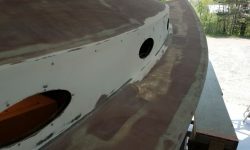 While I’d worked around the openings throughout the deck work, I’d basically ignored anything inside the deck’s outer skin, as my attention was on the significant repairs underway. 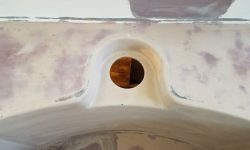 It was only after I got started on what I initially thought would be a simple, quick job that I discovered that much of what I’d thought was fiberglass inside the opening was in fact heavy dosages of The Hated silicone, leftover from the el-weirdo port lens installation that I’d removed early in the project. 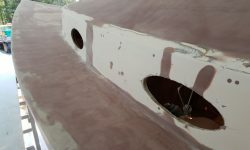 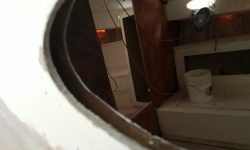 So instead of quickly cleaning up the perimeters of the openings and moving on, I found myself laboriously attempting to scrape away the gobs of rubbery sealant from the tight space between the outer cabin trunk shell and the inner cabin liner, all the while trying to avoid damage to the outer surface that I’d only just finished preparing. 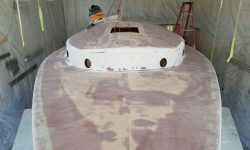 I worked my way through two of the openings on the port side before calling it a day, and looked forward to finishing up the remaining four next time.